Home General Articles Which is better: iPhone medical ID app or medical ID jewelry? Apple has been the leader in mobile technology since the company released its first generation iPhone in 2007. With each new phone the company has released since, there have been even more innovative ways for people to express themselves and communicate with others. When Apple introduced its new iPhone operating system in 2014, one of the upgrades was a digital medical ID built in to the phone. 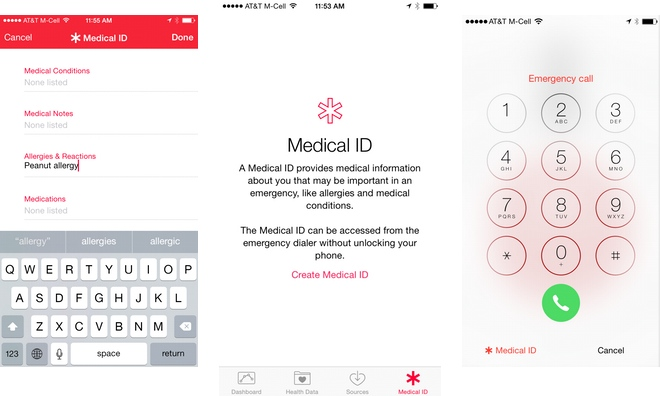 At first glance, the iPhone medical ID appears to have it all. You can enter all your medical information: conditions like diabetes, allergies to foods or medications, medications you’re taking like blood thinner, etc. You can list the name and contact information of someone to call in case of an emergency like a relative or specialist doctor. In the medical notes section, you can even list previous surgeries or indicate that you have an advance directive, such as a do-not-resuscitate order on file. In order to make it so that emergency personnel can access this wealth of information, you need to change a setting to allow access to the medical panel from the lock screen of your phone. Otherwise, the information is just available to you through your Health app. So, with technology like the iPhone medical ID, why would anyone want to buy a traditional engraved metal ID bracelet? The biggest reason is access. If you’re wearing your medical ID bracelet every day, it will always be available when it’s needed in an emergency. Do you always carry your phone with you? Most people would say yes, but if you think about it carefully, there are times when your phone is out of reach. Swimming is a great example. Although phones are becoming water-resistant, no one carries them into the pool on purpose. However, stainless steel and silicone medical IDs are perfect for water sports. The newest, biggest iPhones seem to have batteries that just won’t quit. But there are times, at the end of a long day streaming music and capturing photos and videos that your phone has just run out of juice and you don’t have a charger nearby. The technology of medical IDs is as old as the Iron Age. Engraved metal IDs are always on. Even though you shouldn’t rely solely on the iPhone medical ID app, it can be a great complement to your medical ID jewelry. iPhone, iPhone medical ID, medical ID jewelry, technology. Bookmark.